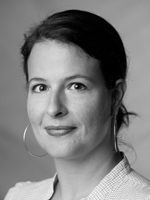 MYRIAM FREY LIVES IN OLTEN, SWITZERLAND. She’s an illustrator, translator and writer (and a local MP). Her short stories have appeared in Ambit Magazine and online at Paraxis.org. 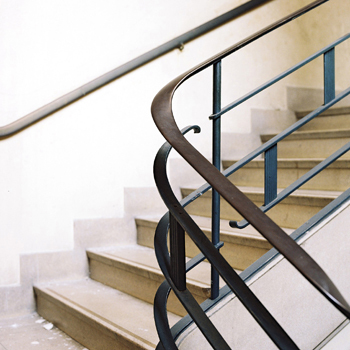 For Still she wrote ‘The Staircase Treatment’ a playful story set in the staircase of an apartment block. In summer, it’s either the back garden or the balcony. When it’s cold, I use a tiny study just five minutes away from my house. I think I had my first ‘I want to do this’ moment reading William Gibson’s early stories in the eighties. However, I shelved the idea somewhat later to become an architect. Twenty years on, I find myself on square one again. Why did you pick this photograph? I’m an architect by training and have a great fondness for staircases. If you’re not sure about a building, take a long look at its staircase: buildings with badly designed staircases very often have hidden flaws and invariably lack a soul. What’s the idea behind ‘The Staircase Treatment’? My godson’s brother used to sleep out in the staircase as a baby because the cool air seemed to help with his eczema. I combined this with a variant of a game I often played while waiting for my children to go to sleep. Are visuals part of your writing? I don’t think there’s much of a pattern at this stage – I’m not sure when and why I have ideas, visually inspired or otherwise. That said, I find the last minutes before I fall asleep quite inspiring. It’s when the brain goes into autopilot and just throws around random thoughts. Images or ideas that still linger when I wake up are generally worth considering for an illustration or a piece of writing. I love the immediacy of the short story and find the format works well with my currently chaotic and highly fragmented writing schedule. I’ve half-started on a novel earlier this year, but suspect I’ll have to be much more focused and disciplined if I want to take it somewhere. And I do. Nicholas Royle recommended your writing and he thought Still would be a perfect project for you. Did you find him or did he discover you? I got in touch with Nick a few years ago because I liked his novella The Appetite very much. That’s how we got to know each other. I shared some of my writing with him, and he suggested I write something for Paraxis, which I did. I’m enormously grateful for Nick’s encouragement and support. 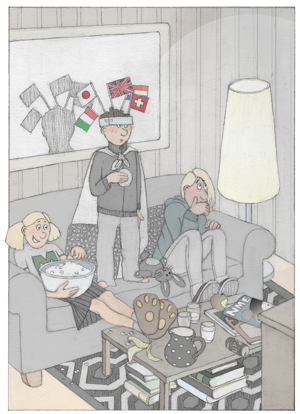 I’m in the finishing stages of an illustrated childrens’ book called Vom Glück, eine Meise zu haben (which loosely translates as ‘On the joys of being crackers’). I’ve enjoyed doing both the writing and making the illustrations.